for in the South Yarra area. 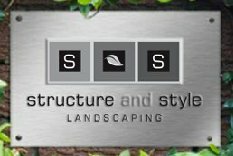 The team at Structure and Style have built numerous high quality gardens over the last 25 years. Often these gardens have been designed by Melbourne’s elite landscape designers and pool companies, including Jack Merlo, Paul Bangay, Robert Boden, Michael LaFontaine, Elite Pools and Out from the Blue. 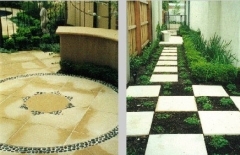 Our focus is on great outcomes, happy clients and garden construction that stands the test of time. We are happy to construct your garden using a plan you already have, or to work together with you to come up with a new design. Let our knowledge and experience create the garden you desire. 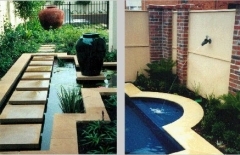 With over 25 years experience building gardens that provide functionality, beauty and value for money. At Structure and Style, we are able to help clients achieve their wishes in a manner that is creative, affordable and most importantly, practical. 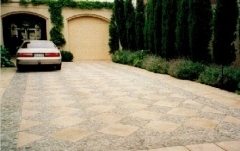 The Selection of suitable paving material for a new landscape is critical to its success. Our experience gives us an intimate knowledge of a full range of paving materials, and which materials best suit a particular style of home and design. Once the selection is made, proper installation is vital. Our construction team are fully versed with the best practice in this regard and take pride in producing exceptional works. A garden water feature is often the most visually pleasing and interesting element in a landscape. As well as having structural integrity, each design should have elements of interest and individuality, so that it maintains its value to the garden over time and does not date, as can be the case with designs put together just to meet a fashionable trend. 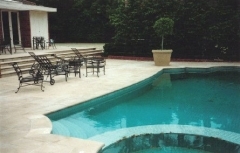 A swimming pool often takes pride of place in a garden. Careful consideration needs to be given to all elements of the pool surrounds to enhance the aesthetic value of the area. These items include paving, decking, pergolas, planting, lighting, fencing and furniture. At Structure and Style, we have worked closely with Melbourne’s best pool companies and look forward to working on yours.